There seems to be two different versions of the book, The Storyboard Design Course: The Ultimate Guide for Artists, Directors, Producers and Scriptwriters (white cover paperback) and Storyboard Design Course: Principles, Practice, and Techniques (yellow cover paperback). The ISBN numbers are different but the number of pages are the same. The one I have is the white cover paperback or as it says, the ultimate guide. Storyboards are essential tools used in the creation of media production. It is the best way to present a concept before sinking in manpower and money. If you take a look at the animation art books I have on site, you'll notice that storyboards are in almost every single one of them, e.g. All Pixar movies, Superman Returns, Wallace & Gromit etc. 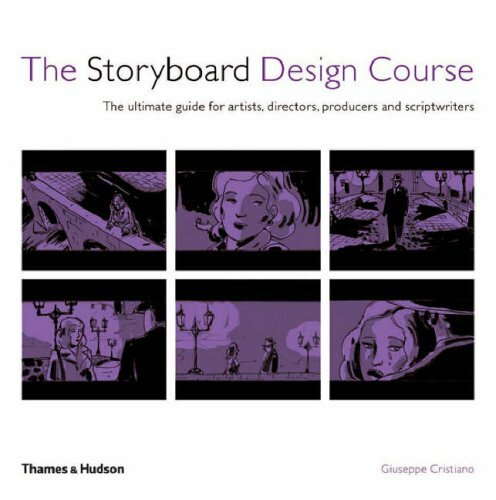 This book is a guide to help the reader understand the purpose, function and techniques of storyboards. The author Giuseppe Cristiano has tremendous experience in the field and in this book talks about storyboards relating to films, advertising, music videos, games and animation. That pretty much covers everything. Lots of examples with actionable descriptions are provided. I think it is important to note that this is not a step-by-step drawing tutorial book. People who already have basic drawing skills will gain a lot from this book if they want to learn how to storyboard. The focus of the book is on the storytelling aspect and how you can aid that with storyboards. Just like the title suggests, this book is recommended for artists, directors, producers and scriptwriters. If you're already an artist, you can advance one level up to be a story artist. Just check out Ideas for the Animated Short. This book appears to be published by two different publishers. Visit the links to read more reviews on Amazon. If you buy from the link, I get a little commission that helps me get more books for review. I really enjoy your website. I tried last night to do something like this, with manga books, but it never got to be as good as your site. So I deleted it.